Skincare is not my strongest forte, but it is something I've always been really interested in and wanted to improve on. I love trying out new products when I can and I'm a sucker for a face mask. I wouldn't say my skin is that bad but it's definitely on the dry side and I could do with a miracle for those awful blackheads, especially on my t-zone. 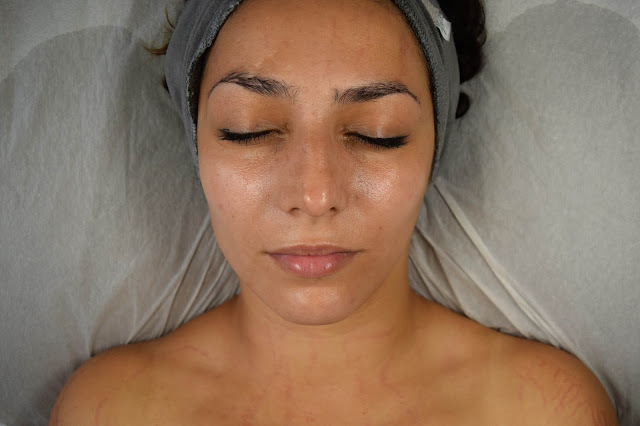 So when I was given the opportunity to visit Skin Aspirations in Chelsea, London and try out the DMK Enzyme Therapy Facial, I just had to and see what wonders it would do for my skin. I hope my review can give you all the details about the brand, the entire process from start to finish and how I felt about it afterwards. It was an experience to remember, not just because it was my first facial but because it was different to what I expected to. I don't know what I expected but it was definitely interesting. Though the business is still quite new, founder Simona Mazentye has worked in skincare for some time before and launched Skin Aspirations as her own business at the beginning of this year to provide skincare services that was suited to each individual customer's skin type. 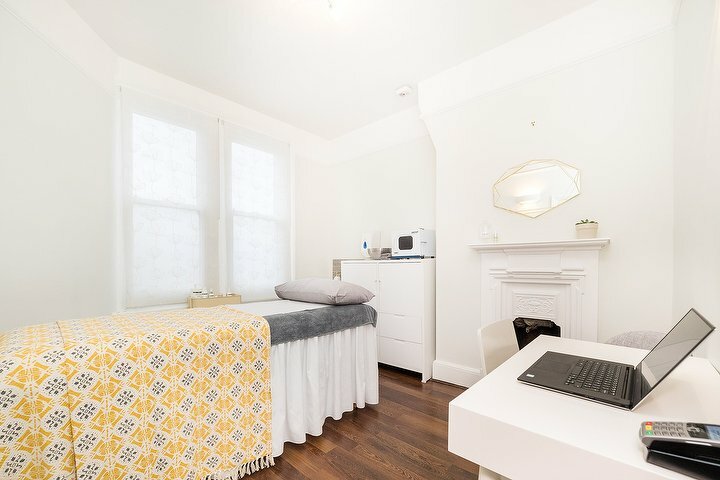 She runs Skin Aspirations in a small room on the top floor of a little place in Chelsea. It wasn't hard to find, but I did walk past before realising I'd gone too far! Simona was so lovely and greeted me at the door before leading me into the room where calming music played. I liked this already. We did a consultation before about my skin and what I felt were my issues and she shared all the necessary paperwork before the treatment was to begin. Though this part sounded daunting at first, it really made me feel like I was in good, safe hands and that I had nothing to worry about - and I really didn't! Simona explained what would be happening next and gave me a little privacy to prepare myself for the treatment. I was to have from my shoulders up bare as this would be where the treatment would be applied. Preparing and cleansing the skin. Acu Klenz – to deeply cleanse the delicate and acne-prone skin. Sebum Soak - to soften the hardened sebum plugs in the pores which prepares the skin for extractions. Pore Reduction drops – to reduce the pore size and inflammation, irritation. For me, extractions took a little longer. I did say that I had trouble with my t-zone and I feel that Simona did a fantastic job at extracting my blocked pores mainly in my t-zone. I enjoyed the process of cleansing and began to really relax. Simona placed towels over my face during the processes to let the products really do their work. Simona was sure to check I was comfortable throughout the whole process too and pointed out things I should look out for and mention if my skin began to react to anything. Luckily, this didn't happen. After a deep cleansing it was finally time for the Enzyme Masque. "The Enzyme Masque is a signature DMK product which enhances your skins capacity to function optimally. This is the main part of the facial. It increases blood and lymph flow to the skin." Simona applied an even layer of the masque over my face, neck and shoulders which would stay on my skin and harden over 45 minutes. In these 45 minutes, I fell asleep for at least 20 of them because I was so relaxed and comfortable! Closer to the end of the 45 minutes I noticed my movements from my shoulders up were extremely restricted due to the hardness of the masque. We forgot to take a picture of this part of the process but it felt like what would be a really good peel-off face mask. 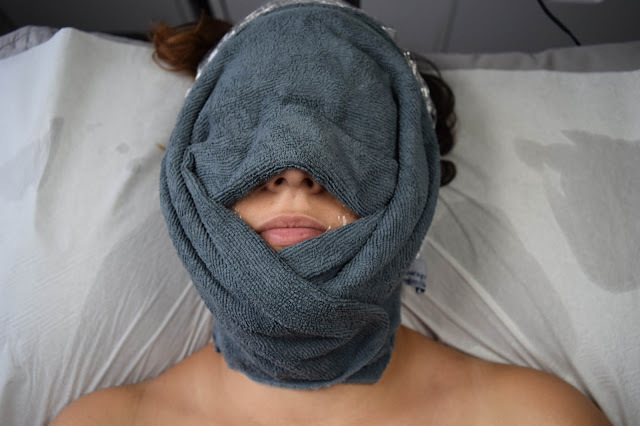 When it was finally time to remove the masque, Simona used a wet towel to remove the masque and was thorough with the removal process. She was sure to have removed all of the product before giving my skin some aftercare treatment as anything left behind might begin to harden again. Acu Klear – anti-bacterial, anti-oxidant and anti-inflammatory lotion for clearer looking skin. Beta gel - to address reactive, irritated or inflamed skin. Strengthen the immune system of the skin. Betagen crème - enhances skin`s immune system, calming and soothing for reactive, irritated or inflamed skin. Contains powerful antioxidants that can assist the healing process while revising the visible signs and effects of aging. Hydroloc – hydrates and locks moisture. After all the aftercare was complete, the facial was finished and Simona talked me through what I might want to do next to look after my skin. She explained to me that the lines in my face were from dehydration and if I wanted to rid them I'd have to drink a lot more water mainly. She also explained that my blackheads were quite tough and that the exfoliator I am currently using might not be working very well to prevent them. She talked to me a lot about what blackheads really are and the types of ingredients I might want to look for in products to reduce and remove sebum in my pores which I definitely will take into account when shopping for my skincare next. She also said to expect some breakouts where the skin is clearing itself up. After this she showed me the results. Right before the facial, Simona asked me if I'd seen photos of any of the results and it must have been the only bit of background research I didn't do before going there that day. She said to expect my capillaries to expand due to the effects of the masque which allow the blood flow to reach the surface of the skin. When I saw my results I was quite surprised! I didn't expect to see physical results so soon and my skin had a nice glow and healthy feel to it. I had expanded capillaries on my shoulders and chest and even on my forehead. I felt like I looked red with anger but I was far from it! Simona explained that my capillaries would return to normal in about half an hour, which it did. Pretty crazy looking right? Seeing instant results was assurance that the facial works and for a week after I barely wore any makeup on my face because my skin was looking so good. It was definitely a kick into the right direction to carry a continuous skincare routine. Two weeks on my skin is still looking pretty clear. I had a couple of outbreaks as expected in the first few days after the treatment but since then my skin has been quite clear and feels really clean. My t-zone has experienced some blackhead returns but not nearly as much as before. I might need to change up my exfoliator as Simona recommended. The DMK Enzyme Therapy Facial costs £150 and I was there for just over 2 hours. Would I recommend it though? I would. Though it is a little bit of an investment, it's an great experience and it is so lovely knowing your skin has been thoroughly cleansed and feels fresh and clean. It's also suitable for people with a variety of skin concerns such as acne, ageing skin, blackheads, pigmentation, sun damage and rosacea. You'd pay that much money for a really good massage, why not a really good facial too! For those who might be wondering, I did a little background research to find out if the DMK products were cruelty free but they are brand who don't sell directly to the public making it hard to find out. I did although find a post from 2013 on their Australian facebook page which suggests that they are cruelty free. For me, this was reassuring but it isn't a clear answer as there isn't any official statement about it on their website. I'd like to think that they would be and hope that I can find out if they are for sure in the future. I'd lastly like to thank Simona for such an amazing experience and allowing me the chance to visit and experience the Enzyme Therapy Facial for myself. I learned a lot about my skin and how to care for it and she was so professional making me feel super comfortable and relaxed through the entire process. I was even a little wobbly on my legs after where I was so chilled. Thank you Simona! If you'd like to find out more about Skin Aspirations and the DMK Enzyme Therapy Facial you can visit their website here.